Lisa Brady examines four important Union campaigns from Kennaway's point of view. She argues, eloquently and persuasively, that the ecology of the Southern landscape and the way 19th century Americans interacted with it, were crucial to the military successes achieved by the Federal armies along the lower Mississippi River, at Vicksburg, in the Shenandoah Valley, and through Georgia and the Carolinas. The bottom lands bordering the lower Mississippi River often proved to be a greater obstacle to the invading Union armies than the Rebel soldiers defending it. Indeed, General Grant's initial failures to capture Vicksburg were in large measure due to unfriendly natural environments and diseases which they spawned. 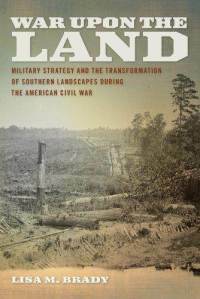 These failures, Dr. Brady concludes, “led him to more innovative tactics that targeted not just the military defenses around the city, but also the city's supporting landscape.” It was a tactic the southern population would, to their dismay, come to know very well. Dr. Brady's pioneering work shows that many new insights into the Civil War can be gained by employing a combination of new disciplines to examine long accepted facts. The trail she and other young historians are blazing should be followed by many others.